Number : Season 20, episode 2 of 6. Which One : Tegan’s return bout with the Mara. First UK Broadcast : 18 – 26 January 1983. Plot : The Doctor takes Nyssa and Tegan to the planet of Manussa, where Tegan begins to have nightmarish Mara flashbacks. Whats good : It’s another ‘Mara’ episode. Tegan gets another much needed character airing. Martin Clunes as a new-romantic with lipstick and chandelier earrings. Whats bad : The story is a little muddled and overly detailed and lacks the deep spiritual punch of Kinda. Martin Clunes as a new-romantic with lipstick and chandelier earrings. Review With Spoilers : Snakedance is the follow-up to Kinda. It came about due to the surprisingly good reception to Kinda, from the fanbase. Season 20 was intended as each episode featuring a different past classic villain. Snakedance was different in that the Mara had appeared in the previous season but was not a classic villain (not at the time anyway!). Snakedance gave Tegan another chance to take centre-stage and play an evil version of herself, possessed by the Mara. It was a rare stretch for a companion to get so much material and shows how highly Tegan was thought of – as a companion. Meanwhile, Martin Clunes of Men Behaving Badly fame pops up in this; bizarrely dressed as a new-romantic, wearing lipstick and earrings. But bizarrely, he’s quite good – as ‘Lon’, the lazy rich son of a great Manussan hero. When compared to its predecessor – Kinda, Snakedance does not have the same religious or spiritual deepness. It plays much more as a straight episode of Who and as a result does not have the same impact or memorability. 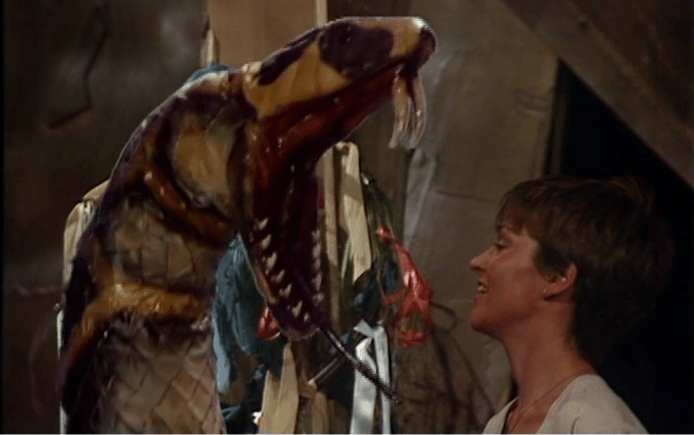 The Mara special effects have definitely improved though, when it comes to showing a giant snake. Still, if you take the two Mara adventures as a whole, then you have two unique stories which stand out from the plethora of other samey monster episodes – from Who’s past. If you liked Kinda, then you may like this also but it’s definitely not as good as it’s predecessor.